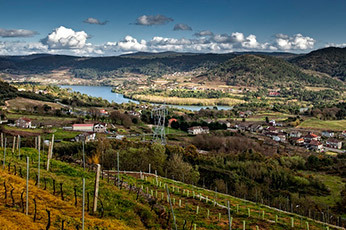 In the province of Ourense, in an area bathed by the rivers Miño, Avia and Arnoia are the lands of the Ribeiro Denomination of Origin with an extension of 2,800 hectares of vineyards located in the municipalities of Arnoia, Beade, Boborás, Carballeda de Avia , Carballiño, Castrelo de Miño, Cenlle, Cortegada, Leiro, Ourense, Puxín, Ribadavia, San Amaro and Toén. The vineyards of this denomination are characterized by being in the middle of fields with a balanced and humid climate. The soils are composed of wet brown lands, with a very low lime content but very rich in organic matter, all of which contributes to maintaining good fertility. Nine white: Treixadura, Torrontés, Lado, Loureira, Godello, Albariño, Alvilla, Macabeo and Palomino. 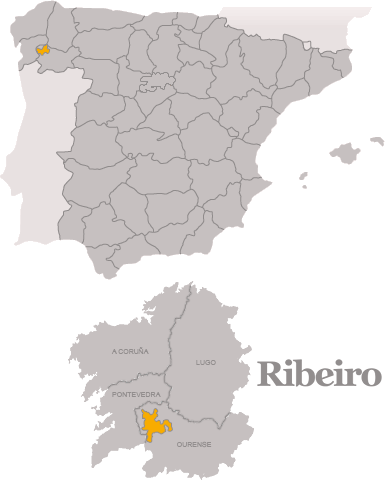 Seven colors: Brancellao, Ferrón, Souson, Caíño, Mencía, Tempranillo and Garnacha. But the backbone of the Ribeiro is the Treixadura, of good plant and medium productivity. The Treixadura, distinguished and harmonious, is one of the main Spanish vine varieties. The wines produced are very aromatic and elegant, mainly fruity, with hints of apple skin and delicate floral notes. The Treixadura is fundamental in search of good monovarietal wines, to which we can add the "Torrontés" and "Lado" almost exclusive of O Ribeiro and according to the fundamental specialists to form some splendid wines.